Construction of industrial building. Camera pan to see interior with heavy equipment and safety gear, steel frames of the building and concrete floor with wide angle lens. hd00:17Low angle view of travelers and commuters passing through London's St. Pancras railway station on a sunny day. hd00:30Construction of industrial building. Men working with heavy equipment and safety gear. 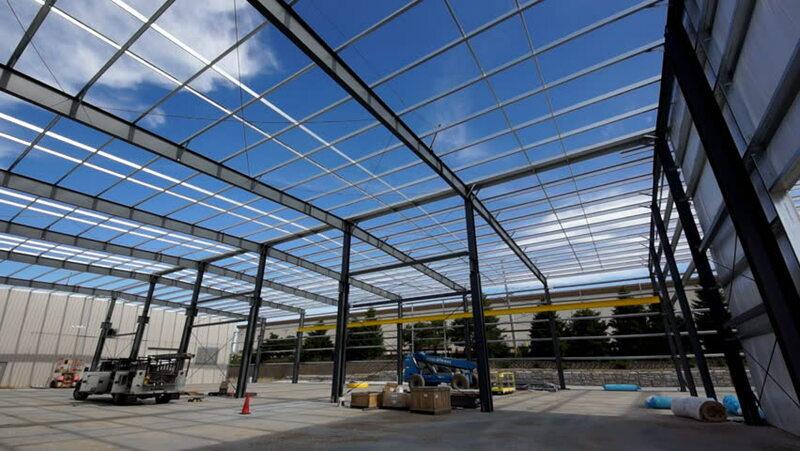 Steel frames of the building and concrete floor. Wide angle lens. hd00:30Construction site steel frame of industrial warehouse shop plant building. A scissor lift and other equipment is in use by hard-hatted and skilled American workers. hd00:21Low angle view of travelers and commuters passing through London's St. Pancras railway station on a sunny day. 4k00:19Top view aerial footage from flying drone of metropolitan city HongKong with development buildings, transportation, energy power infrastructure. Financial and business centers in developed China town. 4k00:16futuristic city, town. Architecture of the future. Aerial view. Super realistic 4k animation. hd00:09Camera cranes up on shelves of cardboard boxes inside a storage warehouse.